Since I lost Tazzie in November, the house has felt empty without a cat. It even appeared that the hounds missed Tazzie and couldn't understand where the black and white ball of fluff had gone. So, in late November we went along to The Lincolnshire Trust for Cats to find a cat that would be confident living in a house full of sight hounds. There were so many lovely kittens and cats to choose from, all deserving good homes, but in the end we decided to take a peek in the 'Weight Watchers' section. (There was a sign on the door that said Weight Watchers - honest!) This was where some of the cats who had been at the Trust for a while, and who had eaten a little too much, were being kept. They were being fed a lighter diet and had more space and activity areas to burn off those extra pounds! 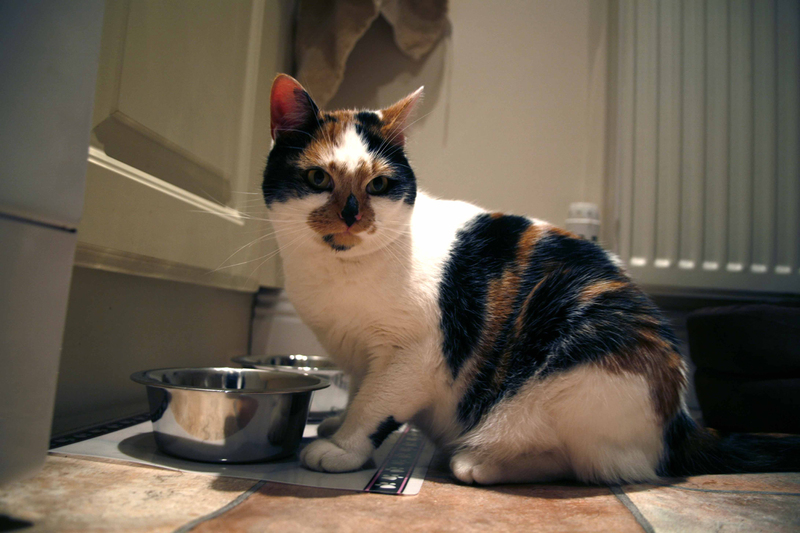 Who'd have thought that a 'feline fatty' (shhhh, don't tell her I said that) would steal our hearts. The not so little bundle of fluff was called Tess and is about 18 months old. She was introduced to Jasper while we were at the cattery and both cat and hound reacted well and Tess' fate was sealed. It's been a month since Tula joined us and she's really settled in, enjoying her first Christmas with us. 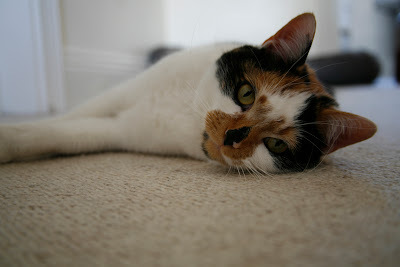 Today has been the first day that she's used the cat flap too and seemed liked a good day to introduce her on the blog. She's slowly losing the extra pounds and is now firm friends with the hounds. Both Mina and Stevie have kept their original names, as their recall was so good. Jasper, on the other hand, was originally called Magic. I renamed him after the Jasper in Twilight, as my Jasper has very fang-like teeth but more importantly has a real calming effect on those around him. Chivers was named after the marmalade brand and Tazzie after the Tasmanian Devil! I'd love to know how you came up with the name for your pet, so please share, if you dare! My Sparky who I sadly lost in March I named after Mark Hughes the football player....I was a huge Man Utd fan when I got her and Sparky's his nickname. Rio I named in honour of my hero Ayrton Senna-the Brazilian racing driver sadly killed in 1994-the year before she was born. I'm impressed that your hounds don't chase her -my grey, Tessie, goes berserk when she sees a cat! Tessie's racing name was Russanda Lark but at the kennels she was called Princess. We thought of a few names for her, but when we went to pick her up from the kennels my daughter said 'she looks like a Tess'. So that was it. Thanks for your comments Lynda & notSupermum. It always intrigues me how people come up with their pets' names. I've worked really hard on cat-training my hounds... one day I'll post the story about Stevie and his early cat-training escapades with my late, lamented Tazzie. Tula is short for Chatula which means cat in Hebrew.